SharePoint out of the box XML Viewer Web Part is used display XML and apply XSLT to the XML before the content is displayed. We can use the same control to display Twitter RSS Feed in a SharePoint 2010 web site. 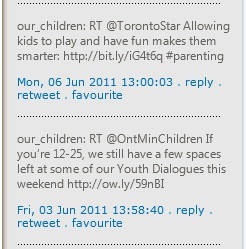 Here I will show how we display the last five tweets sent by a given Twitter RSS Feed URL using XML viewer WebPart. Here the Tweets will be presented in order from most recent to oldest. In addition and more importantly the feed will display twitter messages along with the following Twitter options as per the below image. 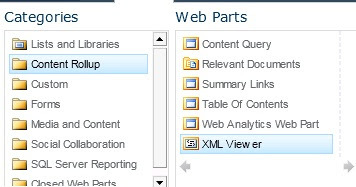 Go to the Edit mode of the SharePoint page and add a XML Viewer WebPart. Go to “Edit Web Part” mode, find “XML Link” field in the properties dialog and insert your RSS Feed URL. Check if the content is receivable by “Test Link” option. Now if we click “OK” and view the WebPart we can see unformatted feed data as follows. 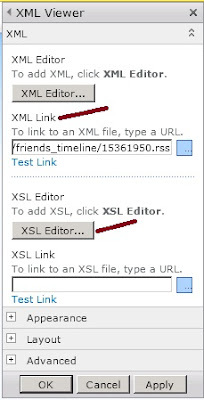 In order to format these data we can specify a XSL style sheet by clicking on “XSL Editor…” button. Then the next question is how we include Twitter Reply, Retweet and Favorite buttons. For the purpose we can specify a Twitter URL with the Tweet id as follows. So here is the complete XSL that displays formatted feed with options buttons. In this code I have looped all tweets received through the feed and limit number of entries to 5 by looking at position() value. Within the loop each tweet id is read into a variable called “pId” and used with options button URLs. “feedItem” is the CSS class that I used to style the WebPart. It is difficult to find the RSS feed button in the new version of Twitter. If you are unable to find it, here is a workaround. "Switch to Old Twitter" mode by using the dropdown next to your username. Scroll down and find RSS button on middle of the right pane. I did try xml viewer web part by providing static xml and xsl. my question is how can i dynamically build the xsl and show on xml viewer web part. FYI, XMl is coming from some public URL. I couldn’t find a way to retrieve Twitter RSS feed based on parameters. One thing you can do is retrieve full RSS feed and filter items based on your criteria, before display, in the same way I have limit the number of records. If you want to dynamically build XSL, I suggest you to use Data View Web Parts instead of XML viewer. So you can pass parameters and specify values in the Parameters Editor dialog.